The Invisalign process begins with a free consultation with an Invisalign orthodontist in Livingston such as Dr. Milestone. During this first visit, we will evaluate your goals for treatment and determine if Invisalign is the right option for you. At Milestone Orthodontics, we eliminate the use of messy dental molds and capture dental impressions digitally. These 3D impressions allow an orthodontist to provide a full overview of treatment including how long it will take and how the final results will look. What Can An Invisalign Orthodontist Fix? Teenagers can have a lot to worry about, between school, sports, and their social lives, finding out they need braces can become an additional source of stress. As a result, Invisalign Teen was designed to provide the same results as traditional braces without affecting appearances or restricting diets. Invisalign Teen is a clear, removable aligner system that provides a nearly invisible way of straightening teeth using custom-made aligners. 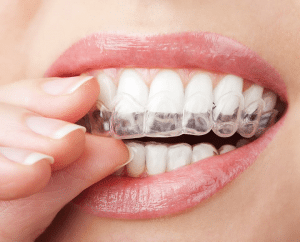 These clear aligners eliminate the use of wires, brackets, and bands that are necessary with traditional braces. What Are The Benefits Of Visiting An Invisalign Orthodontist? An Invisalign orthodontist can offer much more than just a straighter smile. Clear aligners provide the same results as traditional braces while still remaining virtually invisible and completely removable. Invisalign is made of smooth thermoplastic featuring SmartTrack material for optimal results and maximum comfort. In addition, Invisalign can be removed at any time to eat, drink, brush, floss, or clean. Although, while being worn, clear aligners stay undetectable so your orthodontic treatment will never affect your way of life. Yes, at Milestone Orthodontics we offer orthodontic care that is made affordable to fit any budget. We accept cash, check, and most major credit card providers. If your dental insurance covers Invisalign treatment, you may be able to receive the benefits of reduced out-of-pocket expenses. We also offer affordable financing, which is designed specifically to help make Invisalign treatment comfortably accomodate your budget. Dr. Milestone and our team at Milestone Orthodontics are professionals in orthodontic care. We are happy to answer any questions you may have involving an Invisalign orthodontist in Livingston NJ, West Orange NJ, Union Nj, Verona NJ, Nutley NJ, Caldwell NJ, Montclair NJ, Cedar Grove NJ, and surrounding areas of Essex County NJ. Contact Milestone Orthodontics to schedule a free consultation today. Call now (973) 325-1777.